Buruli ulcer, a disease caused by infection with Mycobacterium ulcerans, is one of the most neglected but treatable tropical diseases. The causative organism is from the family of bacteria which causes tuberculosis and leprosy but Buruli ulcer has received less attention than these diseases. Infection leads to extensive destruction of skin and soft tissue with the formation of large ulcers usually on the legs or arms. Patients who are not treated early often suffer long-term functional disability such as restriction of joint movement as well as the obvious cosmetic problem. Early diagnosis and treatment are vital in preventing such disabilities. Buruli ulcer has been reported in over 30 countries mainly with tropical and subtropical climates but it may also occur in some countries where it has not yet been recognized. Limited knowledge of the disease, its focal distribution and the fact that it affects mainly poor rural communities contribute to low reporting of cases. Steady progress is being made now to develop tools for diagnosis, to understand exactly how infection is transmitted and to develop treatment and prevention, and these offer the prospect of better disease control. In 1897, Sir Albert Cook, a British physician working at the Mengo Hospital in Kampala, Uganda, described skin ulcers that were consistent with Buruli ulcer (BU). In 1948, Professor Peter MacCallum and his colleagues in Australia provided a detailed description of the disease among six patients from the Bairnsdale area near Melbourne. They were the first scientists to isolate the causative organism, Mycobacterium ulcerans. In southern Australia, the disease is still referred to as the Bairnsdale ulcer. In the 1960s, many cases occurred in Buruli County (now called Nakasongola District) in Uganda, giving rise to the most widely used name for the disease a�� Buruli ulcer. Since 1980, the disease has emerged rapidly in several parts of the world, particularly in West Africa, prompting action by WHO in 1998. Given the increasing geographical spread, severe consequences and limited knowledge of the disease, the World Health Assembly (WHA) in 2004 adopted a resolution1 to improve the surveillance and control of BU and accelerate research to develop better tools for its control. M. ulcerans is an environmental mycobacterium. Recent information suggests that the organism does not live freely in the environment, as previously thought, but is likely to occupy a specific niche within aquatic environments (e.g. small aquatic animals, biofilms) from where it is transmitted to humans by an unknown mechanism. Although slow growing, M. ulcerans can be cultured from human lesions on media used for mycobacteria, provided the incubation temperature is kept between 29a��33 A�C (lower than that for M. tuberculosis). There is some variation among strains of M. ulcerans from different geographical areas (Africa, America, Asia and Australia), but the relationship between the different strains and virulence in humans has not been established. M. ulcerans produces a destructive toxin, mycolactone, which causes tissue damage and inhibits the immune response. The toxic effects of mycolactone explain most of the virulence of this organism. The exact mode of transmission is still under investigation. Some patients state that lesions develop at the site of antecedent trauma. Research suggests that in Africa, some aquatic insects of the order Hemiptera (Naucoridae and Belostomatidae) can harbour M. ulcerans in their salivary glands and transmit the disease to experimental animals. More recent data from Australia suggest that salt marsh mosquitoes test positive for M. ulcerans DNA, although transmission by this type of mosquito has not been established. Further research is in progress to establish the exact role of insects and other factors in the transmission of the disease to humans. If confirmed, BU will be the only known mycobacterial disease to be transmitted by insects. Buruli ulcer frequently occurs near water bodies a�� slow flowing rivers, ponds, swamps and lakes; cases have also occurred following flooding. 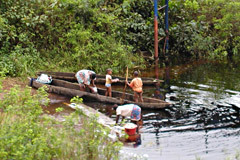 Activities that take place near water bodies, such as farming, are risk factors, and wearing protective clothing appears to reduce the risk of the disease. The reasons for the growing spread of BU remain unclear. All ages and sexes are affected, but most patients are among children under 15 years. In general, there is no difference in the infection rate among males and females. The disease can affect any part of the body, but in about 90% of cases the lesions are on the limbs, with nearly 60% of all lesions on the lower limbs. Unlike tuberculosis (TB), there is no evidence to suggest that infection with the human immunodeficiency virus (HIV) predisposes individuals to BU infection. There is also no evidence that the disease can be transmitted from person to person. There is little seasonal variation in the incidence of the disease. Buruli ulcer has been reported from 30 countries in Africa, the Americas, Asia and the Western Pacific, mainly in tropical and subtropical regions. In CA/te d'Ivoire, approximately 24 000 cases have been recorded between 1978 and 2006. In Benin, nearly 7000 cases have been recorded between 1989 and 2006; in Ghana more than 11 000 cases have been recorded since 1993. In Australia, more cases of BU are being reported recently a�� 25 in 2004, 47 in 2005 and 72 in 2006. Most of the recent cases have come from the State of Victoria and the town of Point Lonsdale. Increasing number of cases are being reported from Cameroon, Congo, Gabon, Sudan, Togo and Uganda. After 30 years of no official report, an assessment carried out in south-eastern Nigeria in November 2006 confirmed some BU cases. Some patients have been reported from China, but the extent of the disease is not known. Recent reports suggest, for the first time, that Brazil may be endemic in the areas bordering French Guyana. These numbers may only be an indication of the presence of the disease but do not reveal the magnitude of the problem. BU not being a notifiable disease in many countries. For these and other reasons, it is difficult to establish the exact number of people affected by the disease and the size and location of all endemic areas. Vigilance is required in the surveillance systems of both endemic countries and countries that have not reported BU but which share borders with endemic countries. Other tropical and subtropical countries have the potential to become endemic; again, vigilant surveillance is important. Occasionally, travellers who have returned from endemic areas to North America or Europe develop BU, which can pose a significant diagnostic challenge for clinicians unfamiliar with the disease. Buruli ulcer often starts as a painless, mobile swelling in the skin called a nodule. The disease can present as a large area of induration or a diffuse swelling of the legs and arms. Strains of M. ulcerans isolated from the different clinical forms of the disease in a particular geographical region appear identical, suggesting that host factors may play an important role in determining the different clinical presentations. Because of the local immunosuppressive properties of mycolactone, or perhaps as a result of other unknown mechanisms, the disease progresses with no pain and fever, which may partly explain why those affected often do not seek prompt treatment. However, without treatment, massive ulcers result, with the classical, undermined borders. Sometimes, bone is affected causing gross deformities. When lesions heal, scarring may cause restricted movement of limbs and other permanent disabilities in about a quarter of patients. Other conditions that may mimic BU include: tropical phagedenic ulcers, often referred to as tropical ulcers; leishmaniasis, particularly in South America; onchocerciasis nodules; and fungal skin infections. Buruli ulcer is often diagnosed and treated based mainly on clinical findings by experienced health workers in endemic areas. Laboratory diagnoses are infrequently used to make decisions about treatment because of logistic and operational difficulties. However, laboratory diagnoses can be used to confirm the clinical diagnosis retrospectively on swabs and tissues taken during treatment, but this is seldom done. Direct smear examination. An examination done on swabs from ulcers or smears from tissue biopsies that can be carried out rapidly at local health facilities where TB microscopy is also done. The sensitivity of this method, however, is low (about 40%) because M. ulcerans bacilli are not uniformly located within tissue and because their numbers tend to decrease over time. Culture of M. ulcerans. A procedure done on swabs from ulcers or tissue biopsies that takes 6a��8 weeks or more; sensitivity is approximately 20a��60%. Polymerase chain reaction (PCR). A test whose results can be obtained within two days on swabs of ulcers or tissue biopsies; sensitivity is around 98%. Histopathology. A method that requires tissue biopsies; sensitivity is about 90% and is useful also for differential diagnoses when the results of methods 1 to 3 are negative. However, methods 2 to 4 are confined to reference and research laboratories, which are often remote from endemic areas. Recently, an innovative dry-reagent-based PCR has been developed that may be used in district hospital laboratories. A simple and rapid diagnostic field test for BU is urgently needed because early disease a�� nodule a�� can be treated locally and inexpensively. However, early disease poses the greatest clinical diagnostic challenge. M. ulcerans toxin is more widely distributed within a lesion than the bacilli, suggesting that the development of an antibody to mycolactone could lead to a rapid diagnostic field test. Equally, the genome sequencing of M. ulcerans has revealed proteins that appear to be unique to M. ulcerans. The testing of these proteins as potential antigens to be used in the development of a simple diagnostic blood test and the development of antimycolactone antibodies are high research priorities. A combination of rifampicin and streptomycin/amikacin for eight weeks as a first-line treatment for all forms of the active disease. Nodules or uncomplicated cases can be treated without hospitalization. Surgery to remove necrotic tissue, cover skin defects and correct deformities. Interventions to minimize or prevent disabilities. Cumulative experience of treating about 300 patients in Benin, Cameroon and Ghana has shown that treatment with rifampicin and streptomycin (RS) for eight weeks according to WHO guidelines leads to complete healing of nearly 50% Buruli lesions. Interestingly, it is also possible to treat some of the patients on ambulatory basis. Recurrences after antibiotic treatment is less than 2% compared to 16-30% with surgical treatment alone. These encouraging developments are changing the strategy for BU control and treatment which until 2004 focused on surgical treatment. In developing countries, sociocultural beliefs and practices strongly influence the health-seeking behaviours of people affected by BU. The first recourse is often traditional treatment. In addition to the high cost of surgical treatment, fear of surgery and concerns about the resulting scars and possible amputations may also prevail. Due to the disfiguration, stigma is a problem that also prevents people from seeking treatment. As a consequence, most patients seek treatment too late, and both the direct and indirect costs are considerable. The impact of the disease on the few health facilities in the affected areas is enormous. The long hospital stay, often more than three months per patient, represents a huge loss in productivity for adult patients and family caregivers, and loss of educational opportunities for children. The long-term care of those disabled, most of whom are children aged 15 years, places an additional costly burden on affected families. Buruli ulcer imposes a serious economic burden on affected households and on health systems that are involved in diagnosing the disease and treating patients. For example, in Ghana in 2001a��2003, the median annual total costs of BU to a household by stage of disease ranged from US$ 76.20 (16% of a work-year) per patient with a nodule to US$ 428 (89% of a work-year) per patient who had undergone amputation. The average cost of treating a BU case was estimated to be US$ 780 per patient in 1994a��1996, an amount which far exceeded per capita government spending on health. In Australia in 1997a��1998, the average cost of diagnosing BU and treating a patient was AUS$ 14 608, an amount approximately seven times greater than the average national health expenditure per person (AUS$ 2557). Early detection and treatment of BU are therefore economical and should be widely promoted. Research is needed to find cost-effective therapies for this costly disease. Bacille Calmettea��GuA�rin (BCG) vaccination appears to offer some short-term protection from the disease. Although the protection is limited, ensuring complete coverage of BCG vaccination in affected rural areas may be useful. Improved BCG-based vaccines, rational attenuation of a live M. ulcerans isolate or subunit vaccines, based on surface proteins or the toxin itself, are potential avenues for vaccine research. A safe and effective vaccine that can be targeted to newly emerging endemic areas may be the most effective way to combat BU in the long term. The complete genome sequence of M. ulcerans was published in February 2007 and it will provide a sound basis to help advance research on the development of simple and rapid diagnostic tests, new drug treatments and vaccines. Sequencing the M. ulcerans genome has led to the identification of the genes that produce mycolactone, revealing how mycolactone is synthesized. This information is helping scientists to develop ways to block mycolactone production, which may provide a new option for treating BU. There are six main priorities for BU research: mode of transmission; development of simple diagnostic tests; drug treatments and new treatment modalities; development of vaccines; social and economic studies; and studies to determine the incidence and prevalence. Since 1998, when WHO became involved in BU control and research, considerable awareness of the disease has been created. Today, a number of endemic countries, researchers, nongovernmental organizations and donors are involved in activities to understand BU. Steady progress is being made in both the control and research aspects under WHO's coordination. The annual meeting of the WHO Global Buruli Ulcer Initiative is attracting considerable participation. This meeting provides a forum at which important policy decisions are made to guide BU control and research activities. The resolution adopted by the WHA in 2004 is helping to attract the necessary interest and support by encouraging all WHO Member States to "intensify research to develop tools to diagnose, treat and prevent the disease, as well as to integrate BU into the national disease surveillance system". The current wave of interest in neglected tropical diseases will undoubtedly contribute to better visibility of BU and help attract the resources needed to accelerate research to develop new tools for diagnosis, treatment and prevention. 1Resolution WHA57.1 Surveillance and control of Mycobacterium ulcerans disease (Buruli ulcer). In: Fifty-seventh World Health Assembly, Geneva, 17a��22 May 2004. Resolutions and decisions. Geneva, World Health Organization, 2004 (WHA57/2004/REC/1):1a��2.